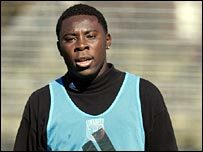 Manchester United manager Sir Alex Ferguson says he is not interested in bringing DC United's American teenager Freddy Adu to Old Trafford. The 16-year-old's agent Richard Motzkin told BBC Radio Five Live on Sunday that both United and Chelsea had held "friendly discussions" with him. But Ferguson told MUTV: "We are not interested in Freddy Adu. "We have watched him as a youngster, but there is no interest in signing him at the moment." The 16-year-old, who made his international debut for the USA in January, is a prime target for Europe's top clubs. On Sunday, Motzkin said: "Chelsea and Manchester United have talked with us about Freddy and are interested. "Those discussions have taken place over the years and will continue." Motzkin's comments followed reports that Premiership champions Chelsea were close to a deal for the Ghanaian-born forward. Any deal for Adu would have to be agreed with both the player and Major League Soccer (MLS) in the United States.